The founders of Kazaa and Skype have officially launched a new online music service that stores the music you listen to in the cloud and feeds it to your various computers and mobile devices. 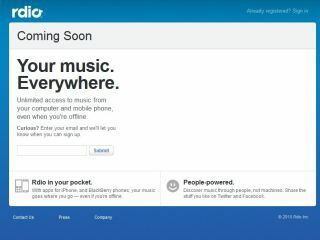 The new service, called Rdio (pronounced r-dee-o) will be competing with already established music streaming offerings from the likes of Spotify, Pandora, Rhapsody, Apple iTunes and Microsoft's Zune. San Francisco-based Rdio is particularly interesting due to its backers being none other than Skype founders Janus Friis and Niklas Zennstrom. The service will offer US users subscription packages of $4.99 a month for an unlimited number of songs from a database of over 5 million songs from the major labels. There is also a Spotify-style $9.99 a month subscription offering which will also let you listen to your music on mobile phones, with an iPhone and BlackBerry app already available and an Android app in development. "Rdio is for US users only at the moment so there's no immediate implication for UK music fans," notes Music Ally's Steve Mayall. "However the fact that it's the founders of Skype and Kazaa mean that it's going to be interesting as they're known for building mass market disruptive technology. They're banking on the fact that more and more of us will want to get access to music wherever we are, rather than download to a computer and transfer it onto various devices. And they're banking on the fact that we'll want to pay for that service. "In the UK we're already getting used to these kinds of 'cloud' services. Spotify is all about access to unlimited music rather than downloading single track, but the interesting thing about Rdio is that they also expect people to pay to be able to access their own music, wherever in the world they are. "In this way they're hoping to challenge iTunes - and Apple is going to make an announcement next week that might show they also want to move into the cloud music space. " Drew Larner, Chief Executive of Rdio is keen to also highlight the social aspects of the service, noting how you can also choose to listen to your mates' music in addition to your own. "Many digital music services have tried to address specific challenges, but no one has managed to elegantly integrate discovery and a high-quality music streaming experience under one roof," noted Janus Friis – a slightly disingenuous quote if you take into consideration that Spotify has already managed to do this pretty well, although only in Europe to date. "We think people are ready for the next evolution in music," adds Friis. "Rdio gives you unlimited access to all the music, anytime, for the equivalent price of one album download per month."